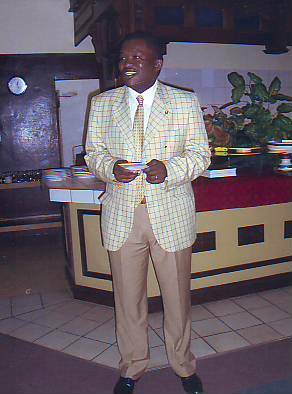 My name is Amos Rammona Diale who was commonly known as Chickzer in those years. The nickname was given by my primary maths teacher Mr Mmamogale. Well I started my standard six in 1984 and completed my Matric in 1989.I had to repeat std. 6 because of the bad company I was in. I was given an option to proceed with my standard 7 in another school (DC) or repeat std. 6 at Tsogo. I wanted to go but my father insisted that I repeat. Where did you do your primary schooling? I did my primary at De-Wildt Roman Catholic School (Holy Redeemer), which is today called Morekolodi in Mmakau and I had 3 principals there, Sister Reader, Sister Xavier and Sister Kieren. What further education institutions did you attend? In 1990 I was admitted in the faculty of Law (BProc) with the then University of Bophuthatswana (UNIBO) but could not even set a foot there because my father could not afford the fees. I then went to Hebron College of Education and did my teacher’s diploma there. I further enrolled and obtained my BA degree with the University of South Africa specialising in Political Science and Educational Studies. I then did an Advanced Certificate in Education (ACE) majoring in Educational management. I did another ACE, this time specialising in School Leadership. To fulfill my boyish desired qualification, I am currently a 2nd year Law student with the University of South Africa. I am the principal of a middle school here in Zeerust but I am also a PWC and PEC member of SADTU North West. I am the principal of a middle school here in Zeerust but I am also a PWC and PEC member of SADTU North West. Chris Hani as well served as a role model. He defined Socialism in a simple manner- He said Socialism is not about big concepts, terminologies and jargon. It is about ensuring that there is bread on the table for everyone. Why can’t we learn from his teachings? I use to think that Mrs Letebele was unreasonable on us, learners, but today I am able to see how precious she was in preparing us for adult life. Allow me to say hello to the class of 1989 but also to challenge them and other former learners to support the marvelous initiatives you started. For many of us, it has been a pie in the sky but you guys actualised what has always been a dream to many of us. Let us contribute in any way possible to take TSOGO to the greater heights. I use to tell my daughter Reneilwe, who also completed at Tsogo (2008), that life out there was like in the jungle, only the fittest survive. There are hard knocks of life and it’s only through education that you can evade them. Love your school, it produced giants: love your education, it is the key to success: have trust in those educators, many of them have been there for decades- they understand your educational needs. 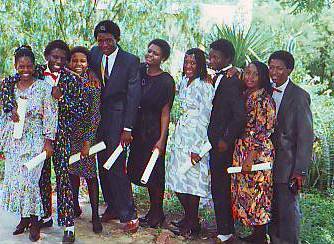 There are so many (good & bad) but our 1989 Matric farewell function(matric dance- today) stands tall. Ever since I was admitted at Tsogo in std 6, I looked forward to that function. It symbolised the harvest of a hard work but also the beginning of the after-school life. In those years, we put on formal clothes, all of us wanted to reach that horizon and be counted, it was a real motivation on its own. Please below see a picture of some of my classmates during our fare-well function. From L – R :Ivy Tlhophane, Phaladi Moche, Jacqueline, Me(Amos Diale), Dorah Kanyane, Lebogang Malapane, Patrick Mataboge, Sphiwe and Clifford Mashigo. There was a need for more classes at Tsogo because of the influx of learners from neighbouring communities. In 1985/86 Father Michael was adding the 4th block of classes on the top left-hand side of the existing building. During our free periods, we would make a chain from the football ground through the passage and the back stirs to the top, passing bricks one by one until the classes were built. (BoRre Sedumedi, Morobe, Manaiwa, Moatshe and others alternated in supervising the human chain). I am proud to have contributed in that manner. Ja, that Henry boy could speak vlot Afrikaans.Hey Henry,I hope u can stil remember bo Schechi,Rabbie and many others.